Courtesy Marginal Revolution, a piece on Wired.com about the Gaussian copula. ... not all calamities are individual, and tranching still hadn't solved all the problems of mortgage-pool risk. Some things, like falling house prices, affect a large number of people at once. If home values in your neighborhood decline and you lose some of your equity, there's a good chance your neighbors will lose theirs as well. If, as a result, you default on your mortgage, there's a higher probability they will default, too. That's called correlation—the degree to which one variable moves in line with another—and measuring it is an important part of determining how risky mortgage bonds are. IT took issue with what she saw as the false innocence of Alain de Botton's new book on work; ADB took issue with IT's irresponsible dilettantism (I paraphrase) in dashing off a post without solid research to back it up; on ADB's suggestion, IT published their subsequent correspondence, here. I'm not a fan of ADB, which is to say that the couple of chapters I read of How Proust Can Save Your Life brought fast and frugal heuristics into play (didn't read the rest, have not read the rest of his oeuvre), which is to say, of course, that I am in no position to make sweeping generalizations and don't. In his commitment to dialogue, however, and to having this dialogue made available to the public, he comes out well in comparison to Wyatt Mason, who flatly declined to allow publication of private e-mails taking issue with his posts on, erm, the importance of writers' engaging in public debate with their critics. I notice that the General Books Essay Paper for Mods includes a metre question in Section B. Section A consists of questions on the 16 or so set texts, of which one had to answer 3; Section B was terrifying, a mixed bag of questions on general topics (role of women in Greek and Roman society, relevance of religion to G&R literature, use of archaeological evidence for the understanding of G&R society, in other words Huge Questions on which whole doctoral dissertations could be written, one of which the hapless Mods candidate must put to rights in 45 minutes). Along with the Huge Questions Section B included a Metre Question! A question for which technical knowledge rather than piss artistry was required! Several passages of Greek and Latin verse were to be scanned, the metre identified, and some sort of commentary on points of metrical interest provided. Now, metre was not something that was actually taught. It was something that had to be picked up independently, by reading various seminal texts - West had not yet published his wonderful book, but there was Maas's Greek Metre, a book by A M Dale whose title I forget, and all the serious commentaries on poetry offered metrical analysis. There was just one slight problem. A M Dale had written back in the 50s, when a sort of touchy-feely approach to metre was in vogue - one could waffle on about the emotional colour of this or that metre for however many hundred words one thought required. So even if there were no metrical anomalies in a passage, there was always plenty to say, because one could just emote away. Those were the good old days. And those were also the good old days in another way, because in those days the Metre Question on Section B of the Mods General Books Paper (the term "microhabitat" always comes to mind, somehow, when I think of this paper) had passages with actual metrical anomalies! So there were points of metrical interest on which to comment! If there had been metrical anomalies, in other words, the question would have been a gift. Instead it presented this sort of sociological morass. What did they want? If there were no metrical anomalies, what could one possibly say in the way of comment? I asked my tutor, Winifred Hicken. Miss Hicken: Oh, I wouldn't bother with that, my dear, the men have been doing it for years. Anyway, the point is, while I do understand the impulse to make a subject accessible to a wider public, and to do so in terms the public is likely to respond to, it makes me nervous when there is something that looks like my tutor's attempt at kindness: the assumption that some very small select group can tackle the really tough stuff, and that those who haven't happened to have that training should accept their limitations, not make themselves unhappy by, I don't know, trying to read Plato in Greek, read Rawls - or, in the case of Proust, just read this lunatic in French. Bad things are going on, so all for now. In Berlin, a tip is not calculated on a percentage of the total. On the one hand, one German teacher told me he would leave a tip of 1 euro on a cappuccino, say, that cost 2.50. But on the other hand if your bill is 9 euros, say, a 1-euro tip is also fine. The way it works is, they tell you the tab, and then you announce what you want to pay (if you'll be getting change). Maybe the bill is 10.50. You say, as it might be, "Zwölf" (twelve) as you hand over 15 euros, and get 3 euros change. So OK, I think I understand the system, but I never feel I have a firm grasp on what counts as under-/over-tipping. 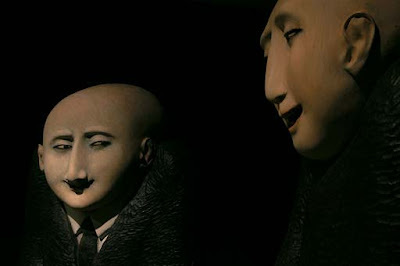 Bourgeois to the core, I just want to glide through life making people feel good in social situations where they anticipate some kind of financial recognition of their contribution. What happens is, I come up with a proposed payment whose tip element would (I know) be grossly insulting in New York*, and I consistently follow the scheme that I think is roughly right, and I keep going to my favourite bar/cafés, and after a while the staff are giving me hugs and offering me free drinks. It's charming but terrifying. But now my battery is about to die, so I must go. * For those who have never been to NY: $1 is not a tip. Four Greek and four Latin texts are on offer. 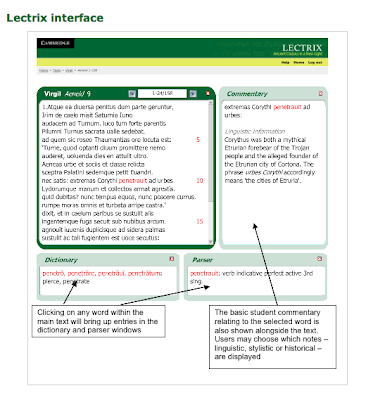 The main focus of the interface is on the text, which is complemented by a range of study tools including a dictionary, a grammatical parser, an English translation, basic and advanced commentaries, and a library of web pages with background material on grammar and context. Clicking on any word within the text will bring up entries in the dictionary and parser windows. 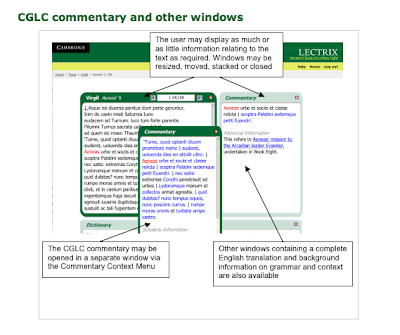 A separate pane will display a basic commentary written specifically for and unique to Lectrix. A more advanced commentary, taken from the relevant volume of the Cambridge Greek and Latin Classics series, is also available. Each is accessed through a separate pane and is keyed to the text in the same way as the dictionary and parser. A further window provides a newly commissioned English translation, again unique to Lectrix. The user can decide how many windows they wish to have open at any one time. Individuals are not eligible for the 30-day free trial, but there's some sort of online tour (which I have not cracked). Ruth Wedes-Melchionne of CUP USA says: In North America the individual rate is US$175 a year, for High Schools it's US$500 a year for Greek/Latin or US$300 for Latin only or Greek only. The texts are Lysias: Selected Speeches (ed. Christopher Carey); Plato's Ion (ed. Penelope Murray); Sophocles' Antigone (ed. Mark Griffith); Euripides' Medea (ed. Donald Mastronarde); Virgil: Aeneid IX (Philip Hardie); Ovid's Heroides (ed. Peter Knox); Apuleius' The Tale of Cupid and Psyche (ed. E J Kenney); Cicero: Catilinarians 1 & 2. To the casual reader the choice of texts seems to have been heavily influenced by instantiation in the Cambridge green-and-yellow series; if texts had to be chosen from the G&Y series, though, why didn't they include Colin Macleod's wonderful commentary on Iliad XXIV? What were they thinking? Well, presumably they thought they should have two writers of prose and two writers of poetry per language. And presumably, well, if you took a survey of readers of Plato and asked for favourite dialogues, it would come as something of a surprise if the Ion were to head the list. (What I mean is, I imagine a random group of classicists and philosophers standing around digesting the results of such a survey, and finding that the Ion had come in ahead of such also-rans as the Republic, the Symposium, the Crito, the Phaedrus, the Phaedo, the Theaetetus, the Sophist... and saying as one: The Ion?) And Dover's commentary on the Symposium is actually in the G&Y series, so, hm, maybe they thought the accusative-infinitive would be too much work for the youth of today? Or maybe they needed living editors to collaborate, so Macleod and Dover were out? Or maybe Penelope Murray is represented by Andrew Wylie, affectionately known as "the Jackal"? I digress. 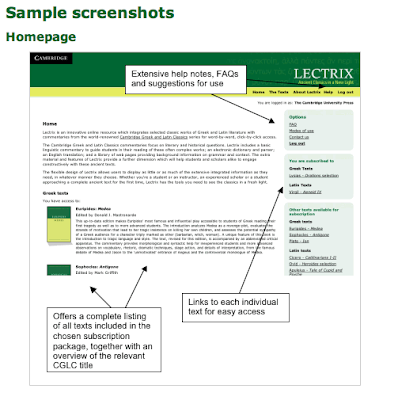 It looks like a wonderful resource, they're planning to add more books, more here. In 7 different studies, the authors observed that a large number of thinking biases are uncorrelated with cognitive ability. These thinking biases include some of the most classic and well-studied biases in the heuristics and biases literature, including the conjunction effect, framing effects, anchoring effects, outcome bias, base-rate neglect, “less is more” effects, affect biases, omission bias, myside bias, sunk-cost effect, and certainty effects that violate the axioms of expected utility theory. In a further experiment, the authors nonetheless showed that cognitive ability does correlate with the tendency to avoid some rational thinking biases, specifically the tendency to display denominator neglect, probability matching rather than maximizing, belief bias, and matching bias on the 4-card selection task. The authors present a framework for predicting when cognitive ability will and will not correlate with a rational thinking tendency. 1. The application was poorly supported. The following were thought superfluous to a reference: CV, samples of relevant work, copy of the application proposal. 2. Eligibility was largely irrelevant. The fact that someone has asked me to write a reference is no guarantee that the terms of the grant/course/other do not specifically exclude him or her from consideration. 3. The application was done at the last minute. 4. Writing the reference was taken to set a precedent: if one was written, there was no reason why it could not be dusted off and sent out as further last-minute opportunities arose. I think that there are a couple of misconceptions at work. One is a belief in a mythical entity: a reference that can just be dashed off in half an hour and popped in the post / fired off in an e-mail. There is no such thing. The second is the belief that, if you have a personal relationship with someone, you can not only ask for support for professional advancement, you can also be unprofessional in the way you ask for it. That's what friends are for. I don't want to spend a lot of time explaining why these are misconceptions; I simply comment that, because they are common among people who ask for references, they are very disruptive. I can't get back all the time that was lost in 2008, so I am simply drawing a line under reference-writing for 2009. I don't like to sabotage applicants who are two days from their deadline; unfortunately it's not easy to know how to notify all the people who are vaguely thinking: 'I might ask HD for a reference if I decide to go in for X.' I'm hoping some of these people read the blog; if you do, bear in mind that I won't be writing references until 2010. 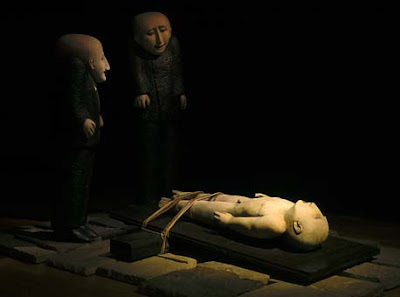 Ana Maria Pacheco has a show in Miami that ends Feb 14. Not sure the blog has any readers in Miami, but if you're there you shouldn't miss this. AMP's website is here. Alexandria, VA on Friday April 17.
but, well, if you can get sponsorship from big pharma or your local drug dealer it looks like a good day out. (On a separate but not unrelated subject, I've just been reading Malcolm Gladwell's Outliers. Readers charmed by the logical incoherence and slapdash anecdotal style of The Tipping Point and Blink will not be disappointed by the new book. (Yes, yes, I know, a reader who failed to be charmed by Mr Gladwell's previous two books had no business buying the third; the title seemed to promise more in the way of statistical substance.) Anyway, the source of grievance is not really the existence or shortcomings of this particular book, but the non-existence of the brilliant book the Man from Tennessee could have written if given the nod. Outliers is on sale at Gatwick, "Fundamental Statistics Concepts in Presenting Data: Principles for Constructing Better Graphics" is available on PDF at Rafe's website and to anyone with $615 burning a hole in their pocket who happens to be in the DC area on April 17. But. 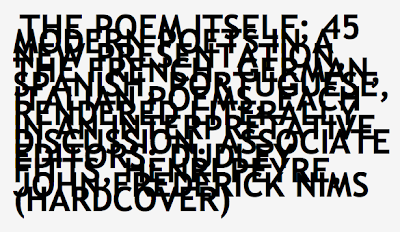 it's a book called The Poem Itself. 45 modern poets in French, German, Spanish, Portuguese and Italian with translations. There's also a companion volume, The Hebrew Poem Itself. was published in 1960 - offers poems in the original language with translation and analysis. A wonderful book. A handful of copies are available on Amazon and Abebooks. • My writing life has been made possible by the Australian publishers who accepted my work when it was rejected in London and New York, who believed in a literature that would define Australia for Australians and represent us to the world. All my novels, including the two that went on to win the Booker prize, were first published in Australia by an Australian publisher. I am now read in 25 languages only because of an autonomous publishing market and industry. Australia was not always thus. Early mercantile life was dominated by importers, distributors and retailers. To anyone still thinking in this colonial way, there will be nothing strange about the present proposal to eliminate territorial copyright and with it the discrete Australian market. What matters, if you are a colonial trader, is that you get the goods cheaper, and you do not weigh, not for a second, the damage to any local culture. If you are a true colonial you will not imagine your colony might even have a culture. You would assume that any indigenous books, for instance, would be inferior to those produced at "home". 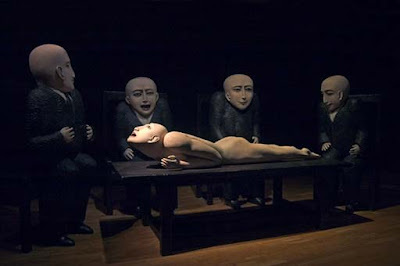 Peter Carey in the Guardian, the rest here. Evidence of how a British resident held in the Guantánamo Bay detention camp was tortured, and what MI5 knew about it, must remain secret because of serious threats the US has made against the UK, the high court ruled today. The judges made clear they were deeply unhappy with their decision, but said they had no alternative as a result of a statement by David Miliband, the foreign secretary, that if the evidence was disclosed the US would stop sharing intelligence with Britain. That would directly threaten the UK's national security, Miliband had told the court.